Tonight, I learned how to make my own custom galaxies with Gimp! Another cool thing I learned, the larger the dimensions of the template .png, the prettier and more detailed it looks in Celestia! But thanks very much for the compliment! Look what AstroSynth gave me for Kepler-47c! In AstroSynth's defense, that earth-like one was from the depths of my own brains. The rest are minor moons and 3 Ganymedians. Same here, actually. I'm also just using the demo version of 2.0. 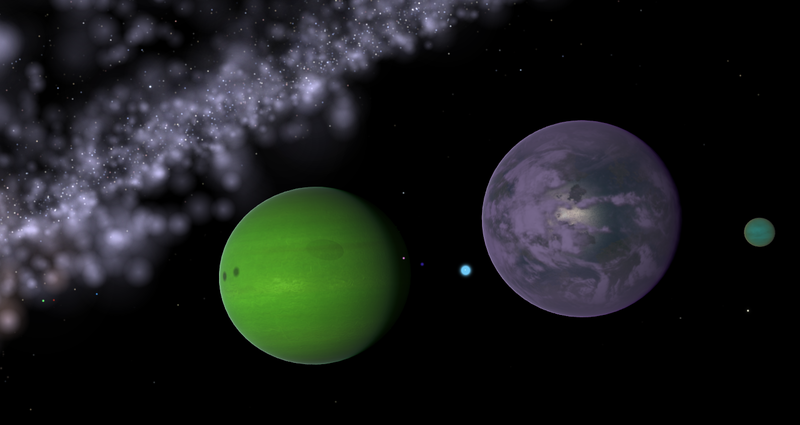 How Kepler-47c got that moon system is because I find the number of moons generated for small gas giants to be pitiful at best, so after putting in -47c's radius, and adjusting the density to make it match the mass indicated in extrasolar.ssc (130 Earths! ), I moved the decimal point one digit to the right to artificially inflate the planet's mass so I could get the maximum number of moons the demo can give me (25), but at the cost of the first 18 - 20 moons all being "rings", and so I used the ring width's to use them for the moons' radii, editing as needed, and the rest is history. 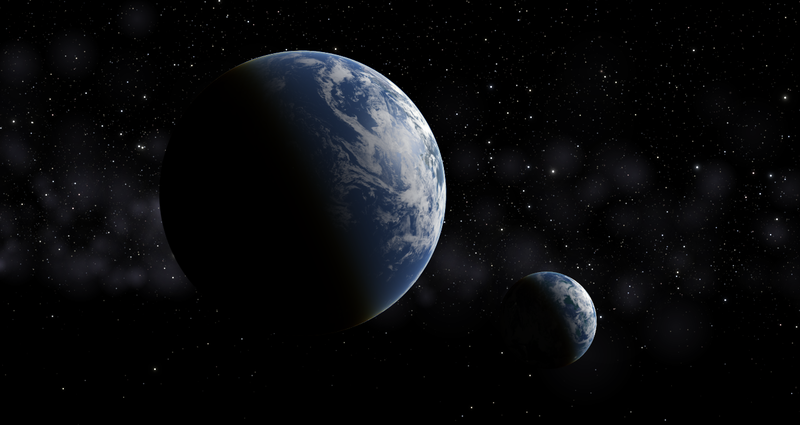 Here's a real-world planet with a hypothesized moon...HD 221287 has a planet in the HZD, about 3 times Jupiter's mass. 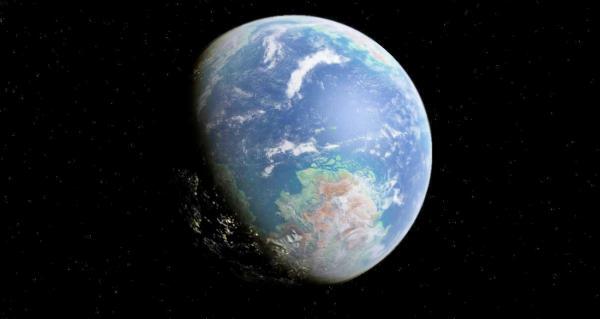 Orbiting is a moon about .09 Earth masses, but possessing a dry, tortured surface. Any water is locked up in ice. This is a habitable desertmoon, called Auriga. Auriga is some way familiar with Mars, but it is hotter, so it is a Hot-Mars. but in size, it is larger than Mars. It is orbiting a gas giant planet called Hephaestus. Hephaestus is orbiting a real star, Psi5 Aurigae, 53.9 light years from our solar system, in the Auriga constellation. And there is living a civilization on the moon Auriga. The population of the Auriga civilization are just a few millions of them. They are between 30-50 million. You can see there are intelligent life there, if you see on the night-side. Tegmine wrote: I wish there was a way to put the AstroSynth output into an .ssc format, it could make life a little easier on the addon front. I think someone posted a while back that they were trying to make an exporter utility for just that. Me too. Except it's 24/7. I was looking at a collection of old CD-RW, and apparently, I found a full, complete stash of old addons from Rassilon (already aware of the directories on archive.org, but I have a 4gb internet data limit. ), so I figured I'd try my hand at updating them to 1.6.1, and to more recent data too, as well as hopefully better physics. So far I did three addons, with some success, Eta Car, V380, and Toliman. 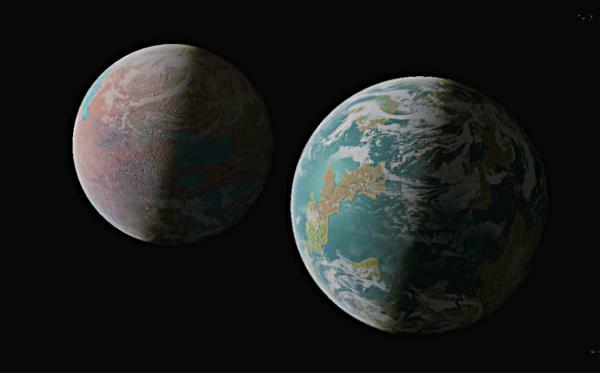 And, I decided to apply a pre-existing texture to the new planet around alf Cen B, and used the browser-based ssc generator for randomization, and it looked nice, IMO. I have a somewhat similar set up with a binary terrestrial, but the similarities end there. Dirdel and Binary, are home to a fiercely democratic, yet highly religious and xenophobic (and oddly, huge tech nerds) insectoid race, who originated on the primary (Dirdel), colonized the secondary (Binary), and geoengineered both worlds to reduce the temperature extremes caused by the tide-locked pair's very high obliquity. Plus they are in a circumbinary orbit around two suns. Very nice work, you two!!! Eburacum, I'm gonna guess that the world on the left of the twin worlds is the closer of the two in this shot, (am I right?) Still a very cool concept, although the tides on such worlds would be fierce beyond measure. Tegmine wrote: Very nice work, you two!!! Eburacum, I'm gonna guess that the world on the left of the twin worlds is the closer of the two in this shot, (am I right?) Still a very cool concept, although the tides on such worlds would be fierce beyond measure. Wouldn't the tides stay in the same place, since they're tide-locked to each other? I've figured that since both objects stay in the exact same position in each other's skies perpetually, the tides pretty much wouldn't go anywhere. Probably the only mobile tides would be the ones caused by the sun(s). Did the name for this world happen to stem from a certain character in a certain.... American.... movie? Anyways, I actually kinda like Celestia's (and my computer's) ability to render interesting shadow plays in trinary systems. @ S. Bowers, updated by myself. Instability is the price of feelings.